I barely know how to start this post, or write it. It was the story of the recipe that turned into three. Our saga begins with our protagonist (that would be me) adapting a Richard Olney recipe for stuffed savoy cabbage. Enter cabbage stage left. Enter stuffing stage right. The audience gasps. I had a lot of extra stuffing. I mean I had 6 pork pastries and a meatloaf worth of extra stuffing. But like all good tales, our protagonist learned along the way and came to a happy conclusion. The learnings: that I prefer to stuff individual leaves to an entire cabbage, and that this stuffing makes a damn good meat pastry/pie! Yes valiant readers, unlike a French movie, this tale ends happily (and with no cigarettes or accordian music either!). I’ve decided that in my quest to make great comfort/peasant food, I must become good at pastry. Historically, I’ve always leaned on Lisl for that task, because really, what’s not to avoid? There is so much conflicting advice out there! Use butter, no, vegetable shortening! Food processor, no, scraper, no, hands! Rest and chill, no, use directly! 2 to 4 tbsp of ice water max!!! but don’t be surprised if you use more! Isn’t this part of cooking meant to be a science? Anyone who has read the last chapter of The Man Who Ate Everything knows what I am talking about — he researched a zillion different permutations for the perfect pie crust, and ended up getting a master demonstration from a baking queen who threw it all out the window and took him by surprise with her technique. I made two decisions. I decided to avoid Crisco and stick to butter, and I focused my reading on three sources: a Nov 2004 Gourmet article I had on the shelf, a post from Shuna at Eggbeater, and a post from Elise at Simply Recipes. 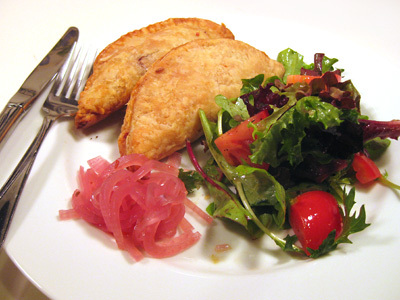 Because Shuna’s site was down earlier for some reason, tonight’s attempt at flaky pastry focused on Elise’s approach. It was a bit stressful. But it actually turned out quite tasty. One small step towards conquering my discomfort with baking. Lisl watched me work with bemused expression on her face, and some helpful advice. 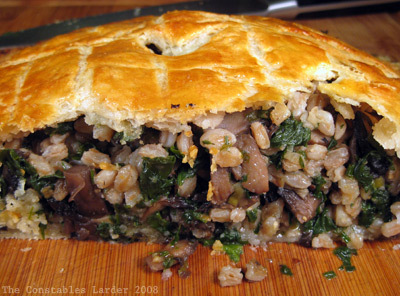 My target was a marvelous farro and mushroom pie recipe I saw in November’s Gourmet, in their vegetarian Thanksgiving menu. Most bloggers who tried this recipe agreed that it is wise to amp up the flavor a bit more than the original, but it is a good starting point and there are lots of different directions you can take the filling — I added spinach and parsley. It was the first time I had worked with farro and I quite liked it.